Ten years after the creation of the Agile Manifesto and the publication of the first book on Scrum, sixteen years after the first presentation of Scrum at OOPSLA'95 and Twenty Five years after the publication of a scientific article that inspiered the name Scrum, the new Scrum Guide 2011 by Ken Schwaber and Jeff Sutherland is out. It has some great new insights to offer. In this post we will take a brief look at the history of Scrum, see what this new Scrum Guide has to offer and visualize the New New Scrum Rules of Play. This can be of interest to people with some knowledge of Scrum but can hold insights for experienced Scrum practitioners as well. Scrum is often traced back to the article ‘The New New Product Development Game’ published in 1986 by Nonake and Takeuchi. This article explains holistic software development using one cross-functional team across all phases of development. In the article this new approach is compared to playing rugby where the whole team takes the ball forward. This as opposed to a relay race where a baton is passed on from player to player which compares well to waterfall development where a team of experts finishes a development phase and passes on the result to another team of experts for the next phase. This article is still a great read. In the early nineties, Ken Schwaber and Jeff Sutherland each separately developed an Agile management approach. In 1995 they jointly presented their ideas at the OOPSL ‘95 (an object-oriented programming conference) under the name of Scrum (a rugby term). They are both still active in explaining and promoting Scrum. One of the Scrum principles is inspect and adapt. This is what Ken Schwaber and Jeff Sutherland have clearly done with their new Scrum Guide 2011. To play a game there have to be clear rules of play. Within the boundaries of these rules every team can try out numerous strategies and tactics to see what works in which situation. The new Scrum Guide 2011 only holds the New New Scrum Rules of Play. All strategies and tactics are removed and will be published elsewhere and can be found in the many books, blogs and articles on this topic. I think this is a great step forward and enables teams to know what they can experiment with while doing Scrum and what puts them out of the game (or causes Scrum’s effectiveness to be impaired). In the rest of this post I will visualize what the New New Scrum Rules of Play are and comment on them. The power of Scrum is that it is such a simple framework. With only 3 roles, 4 work products and 5 events the new Scrum Guide 2011 sets up a process for self-organization of Agile teams. Within a Scrum Team there are 3 roles as depicted in Figure 11. A change here is that the term Development Team is chosen for the ones actively creating the solution and the advice is to make it up of three to nine people. The metaphor of Pigs and Chickens is completely dropped to prevent jeopardizing the relationship between developers and non-developers (supporting roles and stakeholders). The four Scrum work products represent work or value. They provide transparency in future work, work in progress and work that is done in the sense that it has led to a usable Product Increment. Figure 12 shows these work products within an outline of the Scrum process. The Product Backlog is the only source of requirements that can lead to changes in the product. This list is now called ordered instead of prioritized because priority is only one of the criteria that can infuence the order of implementation. Other criteria are market opportunities, technical or organizational dependencies, politics and return on investment in the long run and from a combined set of stories. The Definition of Done is not labeled as a work product but is mentioned very explicitly as providing a shared understanding of when a story is done (as part of a usable product Increment). In the Sprint Backlog the team provides a forecast of what can be implemented this Sprint and the plan (for instance a work breakdown on a task board) for getting it done. The term commitment is no longer used for this purpose to stress the team can only give it’s best and honest guess of what they can get done in the upcoming sprint. The product Owner has an ongoing task in providing insight in the work remaining toward the goal of the development effort (project or release) and his plan for getting there. Burn-down or burn-up charts are no longer required by the rules of play but they have proven to be helpful in many cases so by all means keep on using them where this makes sense. 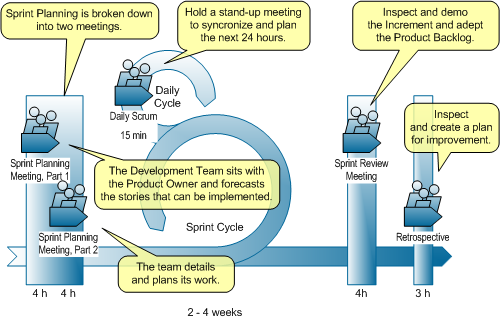 The Scrum process consists of five time-boxed events that are repeated throughout development and provide a basis for inspection and adaption as shown in Figure 13. 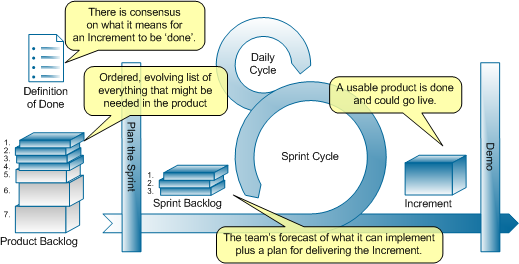 The Sprint encloses all other Scrum events and produces a usable Increment. The main innovations here are the timeboxed character of all the Scrum events and a clear indication of the length of each timebox, based on a Sprint length of one month. For a shorter Sprint the times mentioned will also be proportionally shorter. Although these changes aren’t world shocking they are worth noting. Knowing the difference between the rules and the strategies and tactics will prevent a lot of needless discussion and will surely make you a better team player. Feel free to comment on the new rules of play, ask questions or share your own experiences. Further useful links are also welcome. Thanks for your informative article on agile technology. Scrum and agile is fast growing technology that ensure huge career option for talented professionals. Take Agile Training Essentials for better career. Nice blog, i really liked your post, thanks for sharing!